Azz Cardfile Modern replacement to MS Cardfile.exe for all 32-bit Windows. Get Organized. O in short: Customizable free-form cardfile type database software - manage contacts references notes or any other items. Modern replacement to Microsoft Cardfile.exe for all 32-bit Windows. Simple powerful and inexpensive. Free unlimited trial. 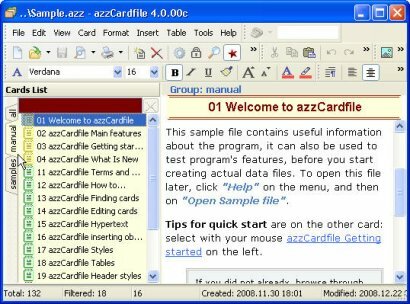 See above information and user's reviews about Azz Cardfile Modern replacement to MS Cardfile.exe for all 32-bit Windows. Get Organized.